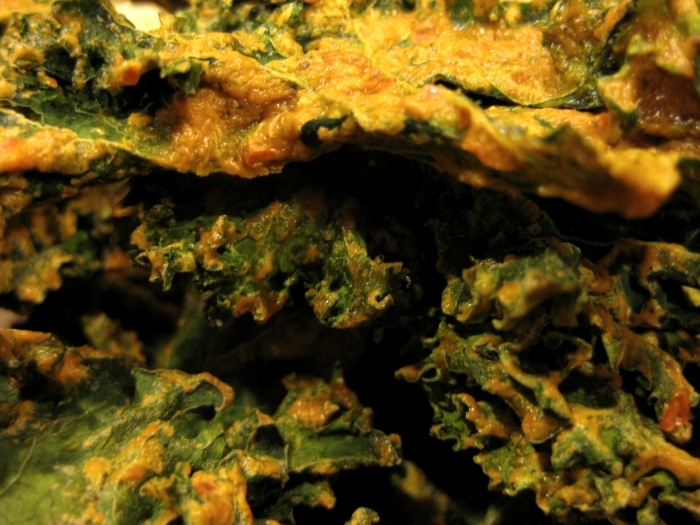 It’s probably a crime that I have not made kale chips in my Excalibur dehydrator yet and I’ve have it for months! Wouldn’t you know I started seriously craving them during my “reduced nut intake” weeks and most of the recipes I’ve seen call for cashews. My goals for the next few weeks or so is to reduce my raw, whole nut intake and up my protein a bit to address a skin issue eating many whole, raw nuts may be causing. One of the ways I’ve been doing that is substituting pureed cashews in many raw recipes with hemp seeds because they’re similar in calories and flavor to me, but hemp seeds have more protein per serving than cashews and less fat. 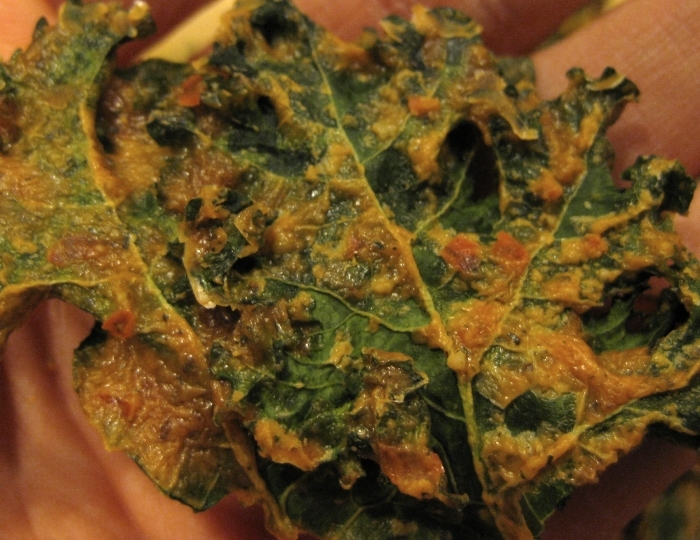 So I played mad scientist in the kitchen last night and created a simple kale chip recipe that worked! Blend lemon juice, red pepper, salt and nutritional yeast in a blender. Slowly add hemp seeds to mixture while blending, then blend on high to a creamy puree. 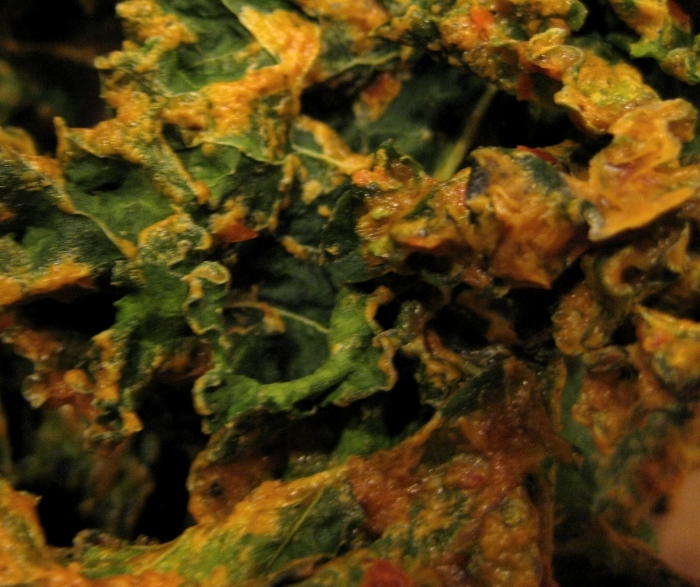 Put kale pieces in a large bowl and pour hemp mixture over them, thoroughly mix until each kale piece is coated with mixture. 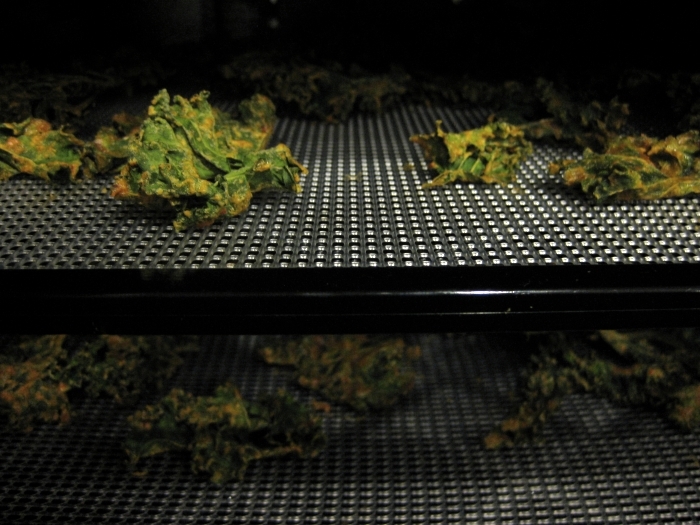 Lay chips out on two dehydrator trays and dry at 115 degrees for 4 hours. Drying time may vary depending on outside temp and desired crunchiness. Another nice thing about this recipe is no nut soaking required, something I often forget to do anyway. I took a container to my mom and she had to restrain herself from eating the whole thing in one sitting. :-) My husband also gave this recipe a thumbs up. Enjoy! Oh my gosh, these look SO good!!! I’ve only made kale chips plain, but now I want to make some that are decked out like this! Oh yum, this is one thing I wish I had a dehydrator for. How much hemp did you use, though? I don’t think the measurement is in your recipe…? Great job and they look sooo good! oh my i wish i could try these! they look so good….and how great that there is no soaking needed. These look so good! For some reason we rarely have kale over here. Wonder why that is. 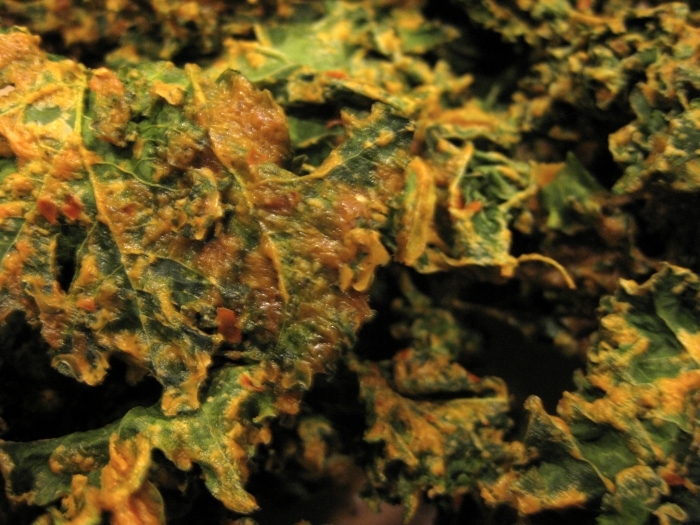 I’ve been dying to try kale chips for ages! I feel left out. It seems everyone is making kale chips these days except me. I’ll have to try them at some point.